A member of the prestigious group Austrian International Casino which has several casinos across the world, the Casino International Batumi is one of the new gaming destinations whose popularity has risen greatly over the past few months. Certified ISO 9001, this sumptuous casino only open since October 2015 welcomes players who travel to Georgia as well as players in online casinos that it partners through Authentic Gaming. As is obvious from its name. The Casino International Batumi is situated in the city of Batumi in Georgia. Also spelled as Batoumi, this city is the capital of the autonomous Republic of Adjarie. Situated on the Black Sea coast, it’s known for its beautiful beaches and top quality touristic infrastructure. The Casino International Batumi is situated in one of its most prestigious hotels, the Hilton near to the popular 6 May Park. Besides the casino, the hotel complex includes 247 rooms, two restaurants, a bar and different services such as a sauna, a spa, a pool and a shopping centre. Situated in a superb modern space in the European style, the casino offers a full gaming area with 105 ultra modern slot machines including automatic roulette machines and 13 gaming tables. Among these there are roulette tables from which Authentic Gaming’s live roulette games are transmitted. The casino also has poker, Baccarat and Blackjack tables. The Casino International Batumi is open from 13.00 to 6.00 in the morning during the week and 24 hours at weekends. Thanks to a pertnership with the developer, Authentic Gaming, some of the Casino International Batumi’s Roulette tables are accessible to online players. 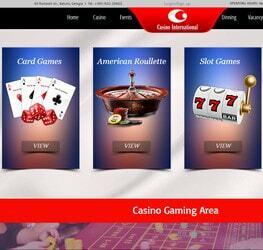 This developer provides the daily live streaming of the games in the casino. To join these two live roulette tables one just needs to register in one of the partner online casinos and to connect when the games are running. Among these casinos, along with others, you’ll find Lucky31 Casino, Codeta, Dublinbet and MrXbet Casino. On these virtual casinos with live dealers’ platforms, two different versions of Live Roulette streamed from the Casino International Batumi are offered by Authentic Gaming: Authentic Roulette Turbo and Authentic Roulette Casino International.